Religion And Spirituality: “Your spiritual life is shifting because you are getting in touch with your honest beliefs. What worked for you in the past does not ring true for you now. This may cause confusion within your family – or within yourself – if you are leaving a religious tradition. Your loved ones may worry about your spiritual safety as you venture into areas they do not understand. This is a very touchy subject for many. It is the cause of war and strife, of separation and of judgment. Religion is a set of rules applied to spirituality; who and how to worship, what is expected and what will happen if you do or do not follow the rules. Spirituality is the application of Love to All That Is, regardless of religion, beliefs, race, colour or species. It is unconditional Love and acceptance of all. It is the art of Allowing one to be who they are, to learn their lessons on their own life journey. To support and hold space for those who take longer to see the Light. If only the whole world could practice “to each, his own” and let others worship who and how they choose to worship. If only we could All see each other as equals, with no need for judgment, fear or war. Slowly we are waking up, realizing that we are so profoundly connected to All. We are remembering that we are all Light bodies under these layers of flesh, despite our belief systems. We come from Source, we are all Divine, we are all equal. We are powerfully connected to the planet herself, and can go to her forests, beaches, gardens and mountains to benefit from her healing, as she can benefit from our positive energy, prayer and intention. If we can learn the reciprocal energy of give and take: towards each other; towards all of the animals, creatures, plants and trees; to the Great Mother Gaia herself. Then we can all ascend into the New Earth together. 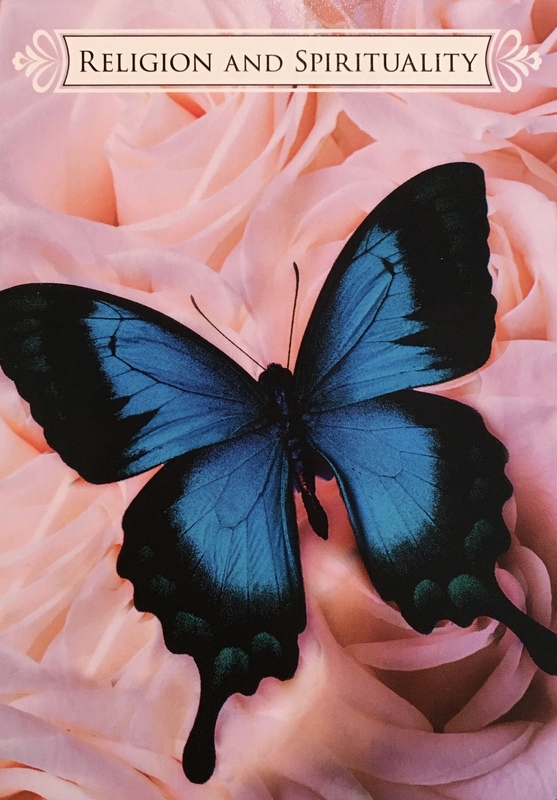 The Blue Morpho butterfly is the ultimate symbol of transformation and change. It is a symbol of Truth, possibility, of communication, of stepping through portals into new dimensions. And here she rests of a bed of pink roses, the flower of Mother Mary, of Unconditional Love.